Photo taken on 6-2-01 from a R.C. Airfield about 3 miles from the departure end of Hollister Air Attack Base. I presume this is a practice run, since there were no incidents on this day. 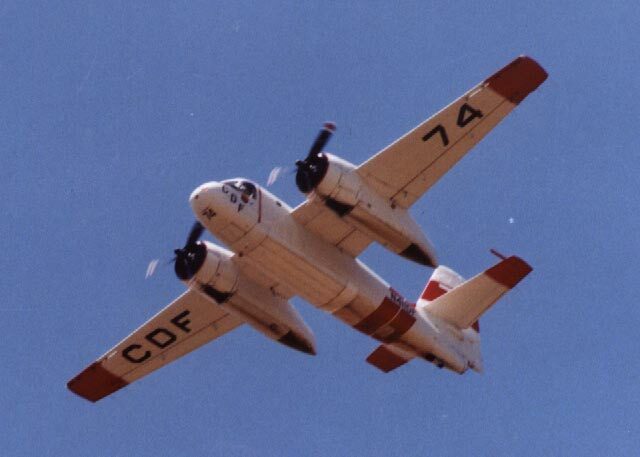 (Note the absence of phos-check retardant on the belly tank, indicating that no retardant was dropped). This tanker is based at the Paso Robles Air Attack Base in the central part of the state. (Thanks, Grant Bright).